The impacts of climate change on species are well-recognised and, in many cases, already happening. These impacts include shifts in species’ distributions and changes in productivity. These changes in productivity can be driven by longer growing seasons in mid to high latitudes, in response to increasing temperatures. Climate change however, is more than a shift in average temperature and rainfall; it also drives extremes – a result of more complex weather and climate events. Changes in the frequency and intensity of these events are early signals of climate change, and the most recent projections (from the IPCC and elsewhere) show that the frequency and intensity of climate extremes will increase during the current century. Extreme events can significantly affect biodiversity on differing time scales. Heatwaves killing populations of flying foxes, or cyclonic winds and floods destroying beaches and turtle nests are examples of immediate impacts. But extreme events can also result in longer-term disruption, by causing changes in phenology, the timing of life history events such as nectar and fruit production. Droughts, for example, can lead to delays and reductions in seasonal flowering and fruiting, while increases in heavy rainfall over a long period can result in flower or fruit drop. Sugar gliders, lorikeets and ring-tailed lemurs and fig birds are all nectarivores or frugivores meaning they could be impacted by the impact of climate extremes on their food sources. Changes in nectar, flower and fruit production, in terms of their timing, quality and quantity, will of course affect the animals that rely on these food resources. In tropical and sub-tropical forests across the world, many species are obligate nectarivores or frugivores. Or, in plainer language, these species have a specialized diet and only eat these tree products (nectar or fruit). Almost a third of the world’s terrestrial birds rely directly on flowers, fruit or seed for food. Even for facultative nectarivores and frugivores (animals who can eat more than just nectar and fruit but have diets rich in these items) they are an important dietary component – especially at specific times of the year. For instance, fruit is a fundamental food resource for monkeys throughout the tropics and sub-tropics. When food is scarce, which can happen on a regular, seasonal, basis, frugivores use diet-switching or change their foraging range patterns to compensate. It is likely that increases in rainfall variability and intensity, and extreme temperatures may result in less-reliable and more spatially-dispersed nectar and fruit resources. Impacts of climate extremes on the vertebrate fauna that depend on these food resources is a global problem, but also very relevant to Australia with our highly variable climate and widespread extreme events. Flowering and nectar production in many Australian eucalypt ecosystems are cued by episodic events such as drought, or flooding rains, or a sequence of dry followed by wet, and many different fauna species depend on these cycles of food availability. 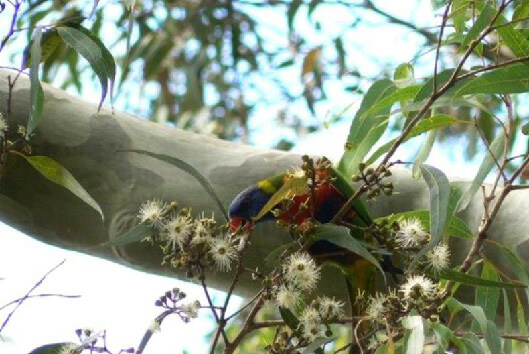 However, heatwaves are known to reduce the regularity of prolific flowering in many species, and one tree species important for many nectarivorous bird and mammal species, Corymbia maculata, spotted gum, is known to produce less nectar per flower after a run of high temperatures. Drought can also reduce nectar production, and in Australia’s tropical savannas, plant-available moisture in the dry season is determined by rainfall in the preceding wet season: if this is lower than average, nectar availability in the dry season will be reduced. Trees in the Myrtaceae family, which includes guava and melaleuca as well as eucalypts, are essential sources for pollen and nectar for a diverse range of Australian fauna. 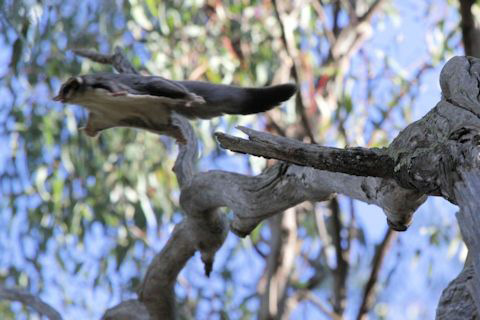 Specialist nectarivores, such as the marsupial honey possum and the squirrel glider, are highly vulnerable to seasonal variations in nectar availability – these variations are likely to fluctuate even more in future. As well as directly affecting the health and productivity of the species that depend on these resources, climate extremes could also result in changes in species interactions and knock-on effects on ecosystem function and productivity, including tree and forest regeneration (think of the seed dispersal and pollination services animals provide). So what do we know about the future? The seasonality and interannual- to decadal-scale variability of rainfall and temperature are already changing, as are the frequency and intensity of extreme events (see Figure 1). It is not clear exactly how tree reproductive phenology will change in response, but it is likely that increases in rainfall variability and intensity, and extreme temperatures may result in less-reliable and more spatially-dispersed nectar and fruit resources. This will affect both mammals and birds. Changes in animal species assemblages may in turn affect ecosystem function, and this could lead to a cascade of local extinctions. We do not have detailed knowledge of the underlying response mechanism in many cases, however, and so don’t know exactly how resource availability will be affected. Carry out biome-specific studies of the impact of extremes, including establishing critical thresholds – how will these impacts vary in different places and in different ecosystems? Take account of how the interaction of climate and non-climate stressors, for example landscape fragmentation, could trigger cascading changes to forests and animals. Climate change is often discussed in terms of what it might mean for agriculture and our capacity to feed a growing human population. Maybe it’s time we started thinking beyond our own needs to consider the consequences of climate change on the food supplies of those species dependent on forest nectar and fruit across the world. 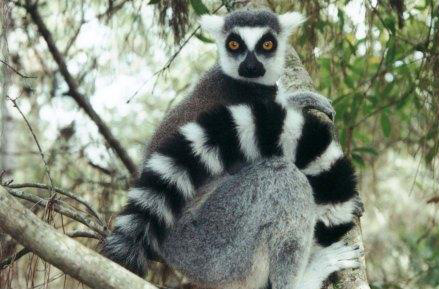 Lemur, one of the many animals dependent on fruit and nectar.